The giant smalleye stingray is a rare and elusive creature, winging quietly off the coast of Mozambique. Now, for the first time, this largest of the stingray species has been captured on film. 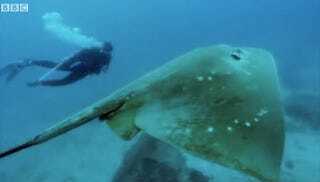 A BBC scuba diving crew grabbed a video of the smalleye, which is the largest and one of the rarest of the 70 species of stingray. The smalleye, which can grow to be more than two meters wide, was first discovered in 1908 and has been found alive only off the coast of Tofo, a small town in Southeastern Mozambique. You can see the video at the BBC's website, and the footage will also be part of the BBC Two documentary Andrea: Queen of the Mantas this Wednesday.